Circles are a great way to add some fun to your layouts. With this page, Susanne shows you how to use coaster (thin chipboard) circles to accent your photos and create a sense of flow on your pages. This layout was created using Chatterbox Powder Bubbles paper, pink Bazzill cardstock, red, white and pink ribbons, Dimension Magic, �Hotspots� silver heart charm, Bottlecaps �Spare Parts by the Paper Studio� and Imagination Project Christmas Rings Coasters. Mat a 6x8 photo with pink cardstock. Place the photo onto the polka dot side of your Chatterbox Powder Bubbles paper and lightly mark its position. Remove the photo and set it aside. Separate the coasters as shown in the layout above. Select the coasters that will have pink centres. Position them inside the marked area of your patterned paper and lightly outline. Cut out the circles you have just marked. Set aside. Apply Dimension Magic to selected coaster parts and allow 3 hours to dry. Adhere your photo to your background. Attach a heart charm to the back of a coaster with ribbon. Adhere the circles you cut out to the backs of your selected coasters with the reverse (pink) side showing. Where applicable, adhere the inside coaster to the centre of the pink patterned paper. Punch three holes in the patterned paper and tie ribbons to the coasters as shown. For the ring coaster part simply tie ribbons around it. Arrange and adhere the coaster parts to layout as shown above. For layering and extra dimension use Magic Mount for some of the coaster pieces. 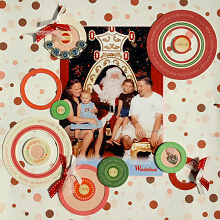 Finally, adhere �PHOTO� bottle caps to �Santa� coaster to finish off.